It hasn’t been that long since Ascent: Infinite Realm was revealed with a trailer that had so much going on in it that it’s kind of hard to tell what exactly the focus of the game is supposed to be. What we do know is that there are airships and mechs and in-flight battle. And it all looks super shiny. 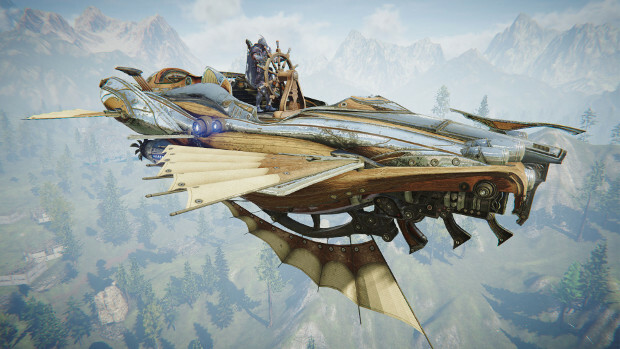 Over the last few weeks, Bluehole has stared dropping posts highlighting some of the game’s features — starting with what they’re calling “The Machinery of A:IR.” This first post highlights the technology that can be found in the game, including mechs, all kinds of “board-able weaponry” that can be mounted on airships, machine guns, turrets, jetpacks, and the airships themselves. And boy are there airships — everything from training ships which are manned by one person to large-scale ships capable of carrying 75 players into battle. The large-scale ships can also carry several flying mounts and cannons. Oh, and for the more peaceful among us, there are non-combat merchant airships. As mentioned above, the developer has also started highlighting different classes that will be available in the game, starting with the Sorceress and Mystic classes — obviously both magic classes. The most recent post (and I’m going assume there will be several more) features the Warlord, Assassin, and Gunslinger classes — more tanky/DPS types. Unfortunately, the site setup doesn’t really allow for linking directly to the individual posts. But you’ll be able to find all the information, along with pictures, on the Ascent: Infinite Realm site. How are they supposed to know what payment model will the game use?